The Homegoing Ceremony also has the traditional funeral elements, such as pall bearers and flower bearers. Homegoing services usually have choirs and lots of singing and music (often sings the deceased's favorite hymns and songs), and often a sermon is preached, in addition to a eulogy or tribute. Sometimes, a few close friends and relatives will give short (about 2 minute) tributes that tell of the greate times and experiences shared with the person being honored. There may also be video slideshows shown at these services. Homegoing Service Programs or Funeral programs and other keepsakes are usually an important part of the homegoing service. These programs are given out to guests and contain a full tribute to the deceased person's life. 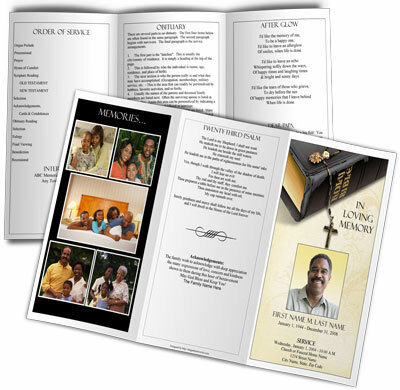 These funeral or homegoing programs contain a cover photo, the order of service that outlines the services of the day, as well as provides an obituary and often has photo collages and a pictograph of the person's life. These programs can be in many different paper sizes, styles and layouts, and can often have many pages. The homegoing program is often as unique and special as the service, and friends and family members look forward to receiveing them. Checkout our Homegoing Program Sample and our Funeral Program Sample Gallery for more ideas for homegoing programs.